Well written Marco and I can't argue with one point. As an American, I was still happy to see team Europe prosper as I thought they showed the most class, heart and preparedness. I too agree completely about proper technique. 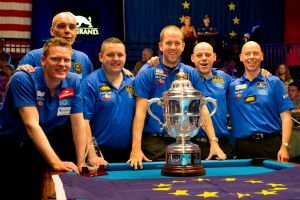 If you can't bring the technique when it's needed such as high pressure situations like Mosconi Cup, it's not really much good. Besides Johnny and Shane, we had a weak team. Morris and Putnam played very poorly and Morris showed a complete lack of class when challenging Daz to take it to the streets over a Euro fan. Classless! I admire team Europe and wish them the best. I do hope US can regain the cup but it's going to take some discipline for sure. Being at the event, one thing was very clear, the European's arrived at the event as a professional team, trained as professionals, acted professionally and took the event seriously. By contrast, the American's uncomfortable even before the tournament began. At the pre-tournament cocktail party Shaun Putnam was wearing a fleece instead of a suit! They were rarely seen in their practise room, and would never be seen at breakfast together. This is surprising as Charlie Williams is a Captain with a great deal of Mosconi experience and should have known how to properly prepare his players both on and off the table. Ultimately, if the USA hope to beat the European's in London in 2012, they need a Team with not only quality on the table, but also the desire to win and the ability to play as a team and not just individuals.